Brothers Burt and Chijioke have already been in Uganda for a week by the time I am to join them in Nairobi, Kenya. My schedule was to leave Albany, NY on Sunday afternoon at 2:30 PM and travel via Detroit and Amsterdam to Kenya, arriving there on Monday evening and then meeting up with the other brethren on Tuesday morning. But things in Albany really made a change for me. One could easily get the impression that it was more than coincidental actions that were trying to hinder my departure. The 2:30 Detroit bound plane loaded and taxied to the runway and then the captain announced that we were returning to the gate and the plane would be unloaded. His cockpit gauges showed a hydraulic pressure problem that he estimated could involve major work. Mechanics were not on duty and would have to be called in. So we unloaded and proceeded to change our flight plans; four agents trying to accommodate 50 passengers. Mine was changed to go through Atlanta and then to London and to Nairobi. Now that next flight that was supposed to leave at 5:55 was unable to leave because a flight attendant suddenly became very sick and unable to work. So the airline sent for a replacement from Detroit and we could not depart until another flight from Detroit arrived. We finally left Albany and landed in Atlanta. As I approached the boarding gate for London, the plane was already in the boarding process, so I thanked God for working all things out for good. In London I have nearly an 8 hour layover so I am able to catch a little rest. After the brief rest in Heathrow we load up the B-777 and begin another all night 8 hour flight on Kenya Air 101, which will take us to Nairobi. I’ve had no upgrades on these long flights and it is nearly impossible for me to sleep. We land in Nairobi at about 6 AM (7 clock hours ahead of our current Eastern Daylight Savings Time) and I spend the next hour going through the visa and passport service line. Finally, after paying the $50 fee, I am released to go down to the baggage and “praise be to God,” all my checked luggage arrived (which included a large box of books and CDs). Outside at the greeting area I quickly find the Kenyan Brother, Paul Wambua and he is very excited to meet me. In the course of the next hour Brothers Burt Asbill and his three Nigerian traveling companions (Chijioke Nwauche from Port Harcourt, Ebere Ohameje from Owerri and Uwak Usen from Lagos) arrive from the Uganda flight. 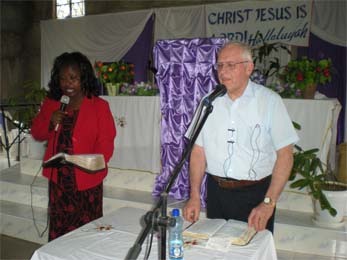 They report that there were excellent meetings in Uganda. Then we all go out to the parking lot where we are loaded into a hired van with a hired driver and we begin the nearly 4 hour ride northwest to Nakuru. More than an hour and ½ is spent just getting out of the capital city of Nairobi. I notice that the road begins to take on a gradual uphill climb for a long ways. Then as we come to a gentle crest I see the sign that says we are entering the Great Rift Valley, a distinctive north-south geologic feature that includes several of the neighboring countries. These lakes and rivers end up feeding the Nile. Along the route thus far is seen a scattering of villages and much small time agriculture: growing of small fields of crops and the keeping of small herds of animals (donkeys, sheep, goats and cows); no grazing space is being wasted and the ground is so dry. We also see some very large dairy herds in the area. In the distant haze I can see the mountains that make up the western border of this great valley. From this point on, the terrain begins to gently slope downhill and is more sparsely populated. One can see many miles of dry scrubland, brush and scattered trees. I am reminded of the Serengeti. It was about at this point that we spotted a couple of herds of wild zebras; no other African wildlife is seen on this run. 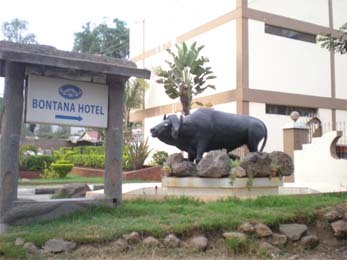 When we got to Nakuru we were taken to the Bontana Hotel and checked in. It is noted that the hotel does not have A/C but the climate here is such that it is not needed. After our lunch I crashed for several hours in a real horizontal position, the first real bed in two long days. Tomorrow we will be driven south southwest about 20 minutes to Njoro where we will have nearly a week of meetings. On Wednesday we were picked up at about 11 AM and driven to the nearby sprawling Village of Njoro (just don’t pronounce the “N”). The last mile or so is on a very dusty dirt road. This is an agricultural area; many fields are plowed and waiting for the rains which are coming late this year. But Brother Paul said, “Please don’t pray for rain until the meetings here are over, otherwise we will have an awful muddy road to deal with.” In the meetings we begin laying groundwork for the “sonship, end time, death-to-self, kingdom” message. We have two meetings at which Chijioke and I speak. Burt will be speaking tomorrow. We have an interpreter translating into Swahili. 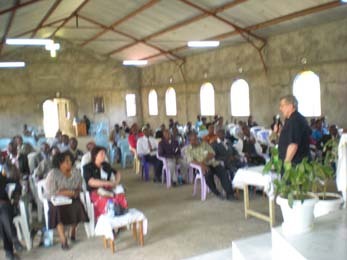 The audience is made up of about 40 brethren, all pastors (90%), spouses or other church workers and they come from a great variety of Kenya locations, also Tanzania and Congo. Thus far there seems to be a real openness to the message. 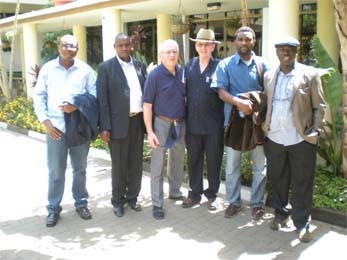 We are taken back each day to the hotel in Nakuru for supper and sleep. So there are four very intense days of teaching and preaching the word. As the last day meeting on Saturday begins to approach its last hour we hear rain on the metal roof of the building. It’s just a nice shower and it settles the dust somewhat; and I remember Br. Paul’s request for rain prayers. On this particular day we are picked up earlier than usual and returned back to the hotel later than usual. While we are sitting at the supper table, Br. Chijioke tries to call Mombasa to arrange for the next leg of our journey. Br. Kinogah informs him that a church has just been bombed that was located near to his building. Suddenly we remember a prophecy that came forth during the meetings concerning Kenya, that there would be a series of explosions, starting small and getting larger. Since the five of us travelers are all together, we agree that we must really seek the Lord’s will concerning the continuation of this trip. Within a short period of time we were in the process of cancelling our flights to Mombasa and changing our flights toward home, this whole process being greatly hindered by the Hotel’s internet system being broke down for the remainder of the night. Is this just another coincidence? But we have also made another possibly significant contact here. There is a man who has attended nearly all of the meetings and in the front row. He has clearly been enjoying the word he is hearing. He is from Mombasa and is trying to get us to come there for meetings sometime. I understand that he has recently been appointed to a position of oversight over 70 other churches. Let us see what comes of this. 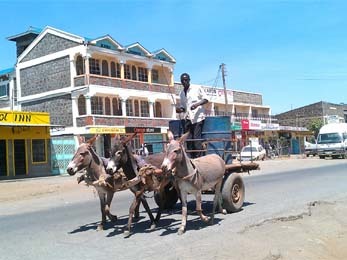 The ride by a hired van back to Nairobi started out in a conflict with the driver over the quoted price. Then once we got underway we ended up seeing a greater variety of wild animals: the zebras that seem to have lost their fear of humans, a couple of baboons begging snacks from passing cars and in the distance a herd of antelopes; still far from a safari. As we got into Nairobi, the driver-passenger conflict arose again when he wanted to summarily dump us at a restaurant that was not even a hotel, nor was there one nearby. We ended up persuading him to take us to a nice hotel we had seen a little further back on the highway. And indeed the rooms are nice. It looks like they have the mosquito issue in better control here than in Nakuru and we will probably be getting hot water when we need it here. 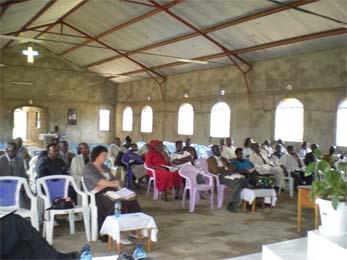 In conclusion, all five of us visitors believe that the meetings in Njoro were ordained of God. Can you imagine what will happen in Kenya when 40-60 more preachers start proclaiming this message to others? We believe that is really why we were sent; Mombasa will have to be another time. We (including the whole team) send our love, thanksgiving and prayers for you.